Tokyo, February 14, 2018 - TOA Corporation (Headquarters: Kobe, Japan, President, CEO: Kazuhiro Takeuchi) to redevelop its research and development center Takarazuka Workplace (Takarazuka, Hyogo Prefecture) and construct “Knowledge Square”, a new center for business creation. The location to be redeveloped is Takarazuka Workplace, located in Takarazuka, Hyogo Prefecture, and which currently serves primarily as TOA’s research and development division. Under the redevelopment plan, a new R&D tower will be built on company grounds that span approximately 21,000 m2. As part of its environmental design, the new development will also include green areas and a garden. Construction will begin in March 2018, and after the center is completed in December 2020, it will become a driver of growth for the TOA Group by serving as a location that creates new value and generates business. TOA - wireless microphone is a microphone without a physical cable connecting it directly to the sound recording or amplifying equipment with which it is associated. 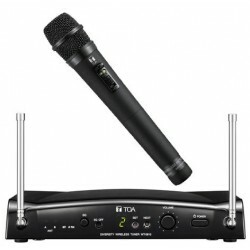 TOA WS-300H UHF Wireless SetThe WS-300H includes a headset wireless microphone and a diversity tuner..
TOA WS-5225 UHF Wireless SetThe WS-5225 includes a handheld wireless microphone WM-5225 and a d..